You’ll never hear those words after making pumpkin baked oatmeal. It’s warm. It’s yummy. It’s pretty. It’s fun to make. 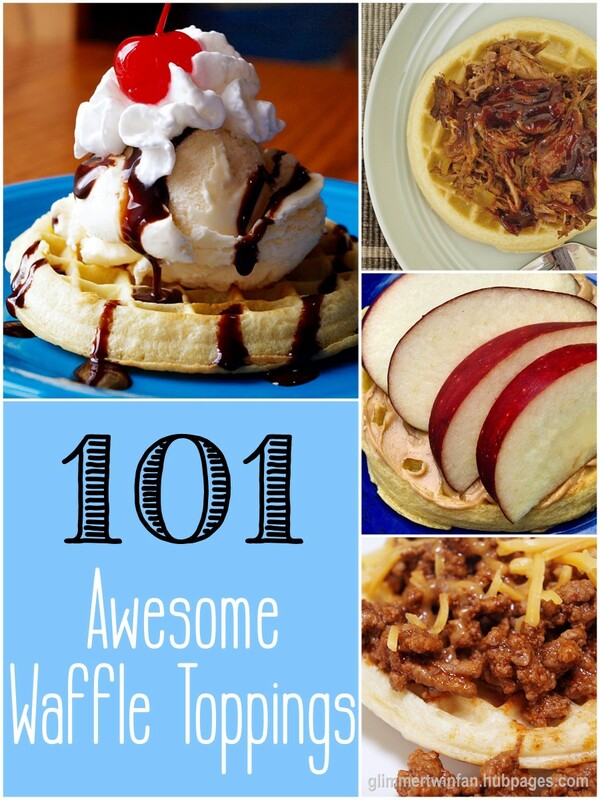 Best of all, your kids will eat this healthy breakfast, and never know how good it is for them. Oatmeal is a whole grain. It’s minimally processed, and contains more nutrients than refined or processed grains. It’s much, much healthier than most cereals. Oatmeal is packed with soluble fiber, which encourages slow digestion. It’s excellent for people trying to keep their blood sugar under control. Oatmeal is a good source of healthy carbohydrates. A bowl of oatmeal a day can help lower your cholesterol by as much as 23%. The antioxidants in oatmeal help reduce the risk of heart disease. The best reason to eat more oatmeal? It tastes great! Especially when you bake it in a pumpkin. A small pumpkin. For two people, one that weighs about a pound and a half will do. Your favorite hot breakfast cereal or grain. 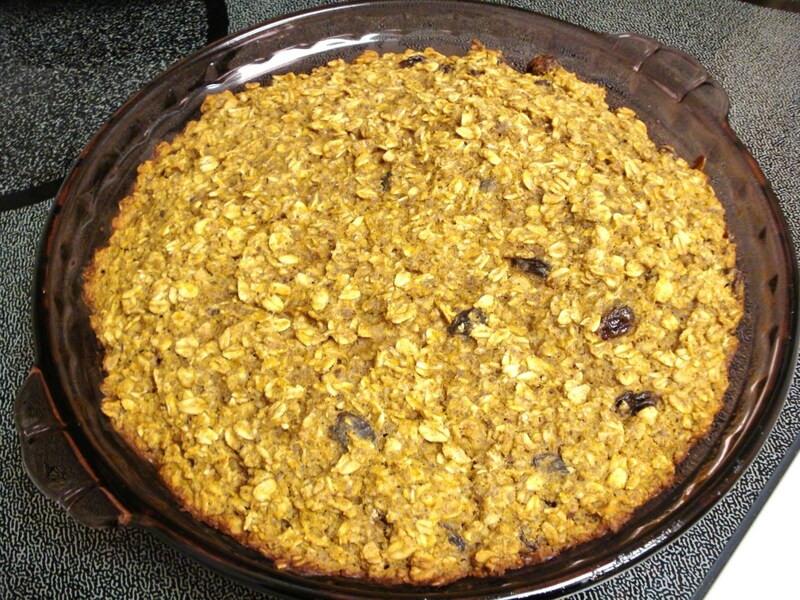 I used oatmeal, but this recipe will work with rice, quinoa, and probably any other tasty breakfast grain you want to bake in a pumpkin. You’ll need enough to fill your pumpkin about halfway. Water. Enough to cover the oatmeal or grain and fill the pumpkin. Raisins, nuts or dried or fresh fruit, if you like. Apples, dried apricots, and dried cranberries all work well in this recipe. Spices. I used pumpkin pie spice inside the pumpkin, and cinnamon on the oatmeal. Also, a bit of salt and pepper. Start by cutting the top of the pumpkin open, just as you would if you were carving a Halloween jack-o-lantern. You’ll want an opening that’s big enough to work in, but not too far down the sides of the pumpkin—because you can only fill it up to this cut line. 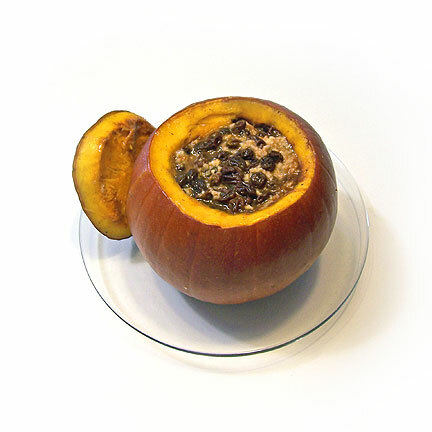 Use a spoon to scrape out all the seeds and the web of pulp that holds them in the pumpkin. 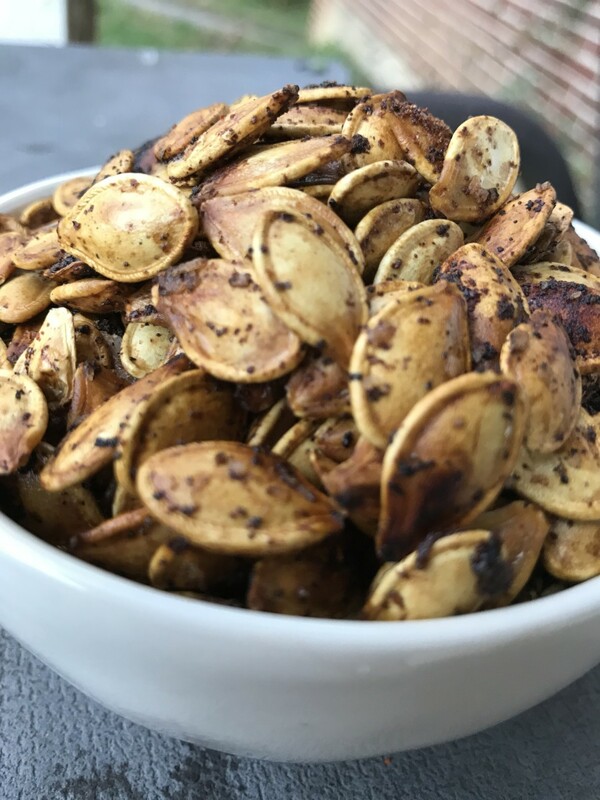 Don’t throw the seeds away—you can cook them while the pumpkin is baking, to make a snack for later. Now’s the time to spice the pumpkin. I usually sprinkle a little salt, pepper, and pumpkin pie spice all around the inside before filling it. Pour enough of your oatmeal or grain into the pumpkin to fill it halfway. Top with whatever raisins, fruit or nuts you’ve chosen to add. Sprinkle half a teaspoon of cinnamon or your favorite spices over the whole pile of goodies. Add water slowly over the pile of dried ingredients inside the pumpkin. Use a spoon to gently mix the water into the dried ingredients, adding a little more at a time, until the ingredients are wet, and the pumpkin is full to the top. Don’t worry if your oatmeal looks really watery right now—it will get thicker, and the process of cooking the pumpkin will absorb some of the water as well. And don't worry if some of your add-ins, like fruit, seem to float on top of the water. 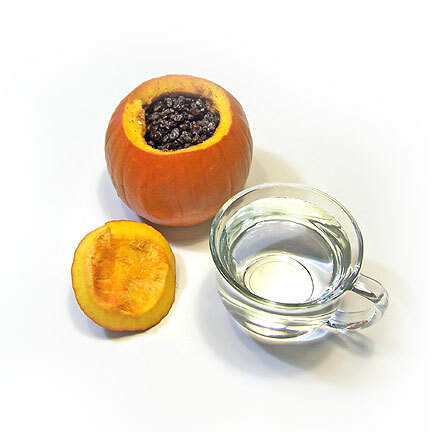 Once the pumpkin starts cooking, everything will absorb water, and your dried fruits will get nice and plump. 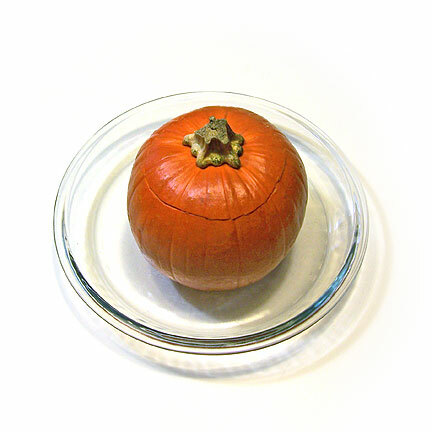 Place the filled pumpkin in a baking dish. Put the top back on it, and cover the stem with a piece of foil so it won’t burn. Bake for about an hour at 375 degrees. The pumpkin is done when you can stick a fork into the flesh easily, and it comes away from the skin without effort. Remove the pumpkin from the oven, and remove the top carefully—there may be a little blast of steam waiting for you. To serve, use a large spoon to scoop out oatmeal and pumpkin flesh. 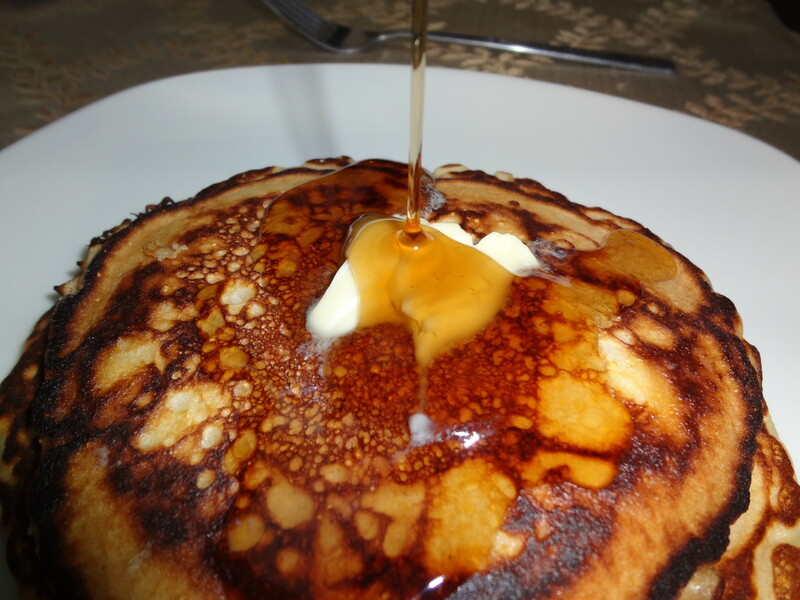 Top with a little butter or margarine (I’m vegan, so I use Earth Balance), maple syrup, almond milk or whatever you’d usually put on your oatmeal. One small pumpkin feeds two or three people. I generally have plenty of pumpkin leftover after eating all the oatmeal, to use in other recipes. 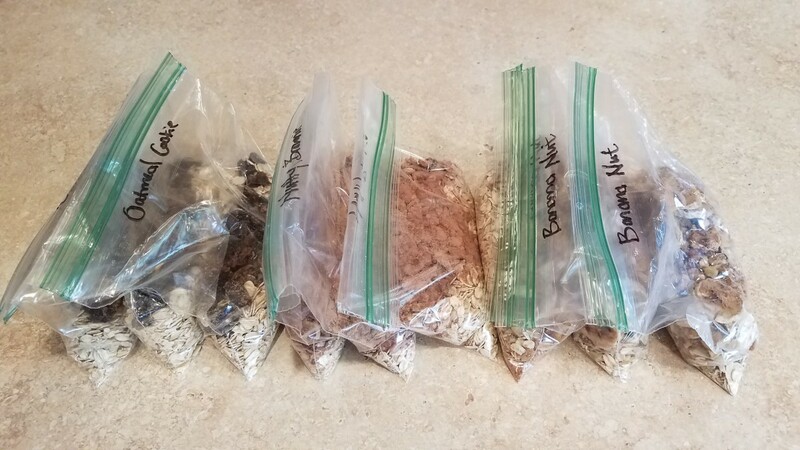 Leftovers can be stored for two or three days. Just put the lid back on the pumpkin, and put it in the fridge. 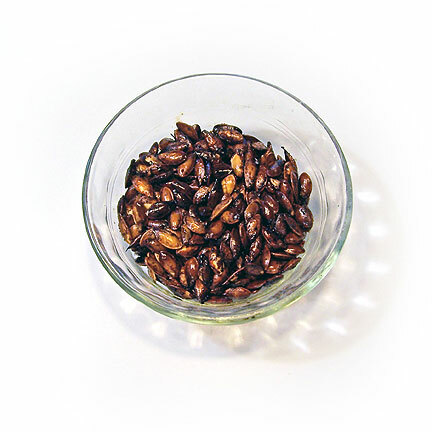 While the pumpkin is baking, you can make pepitas—baked pumpkin seeds. Clean all the orange pumpkin pulp off the seeds, Arrange them on a baking sheet that’s been sprayed with cooking spray. Spray the seeds lightly with cooking spray, and salt lightly. Slide the baking sheet into the oven and cook for ten minutes. Remove from the oven, toss, and return to cook until brown. Pumpkin seeds cook pretty quickly, so these will be done long before the pumpkin is cooked. Set them aside to cool, and snack on them later. 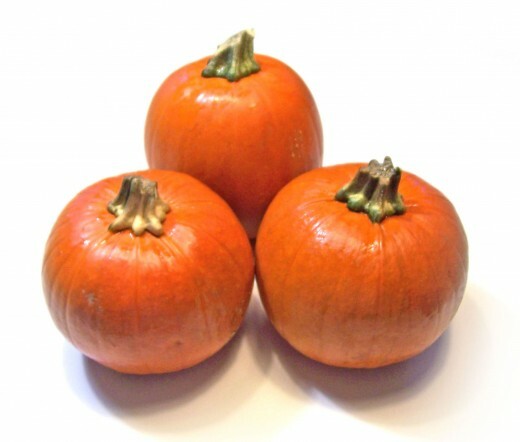 Yields: Serves two to three people per one pound pumpkin. 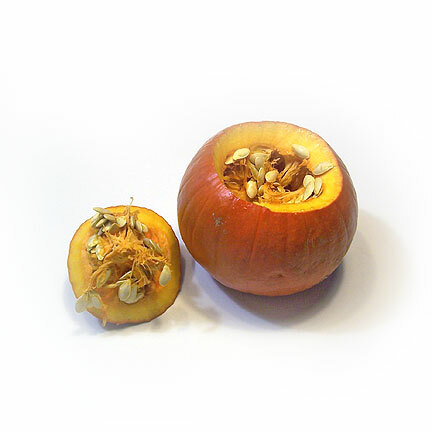 Cut the top of the pumpkin open, and scrape out all the seeds and webbing inside. Season the pumpkin with salt, pepper, and spices, as desired. 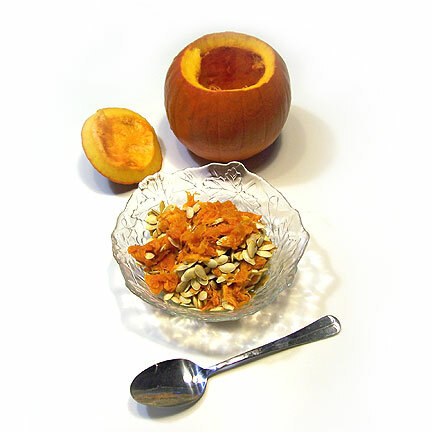 Pour the oatmeal, and any nuts, fruits or raisins, into the pumpkin. Add spices as desired. Cover the oatmeal with water. Replace the top of the pumpkin, and cover the stem with foil. Bake at 375 degrees for one hour, or until the pumpkin flesh is soft. 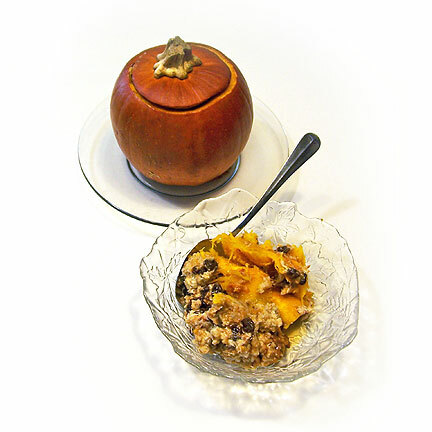 I love the idea of cooking oatmeal in a pumpkin. 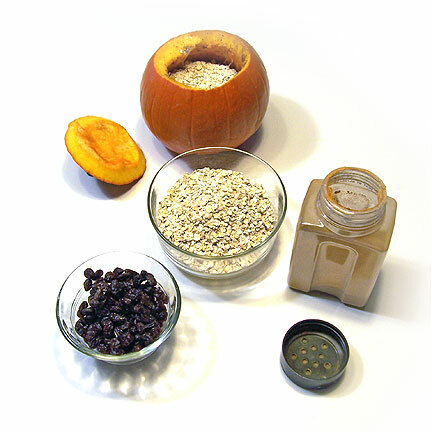 The mingling of flavors from warm oatmeal, pumpkin, fruit, and spices sounds delicious. wow that looks good! 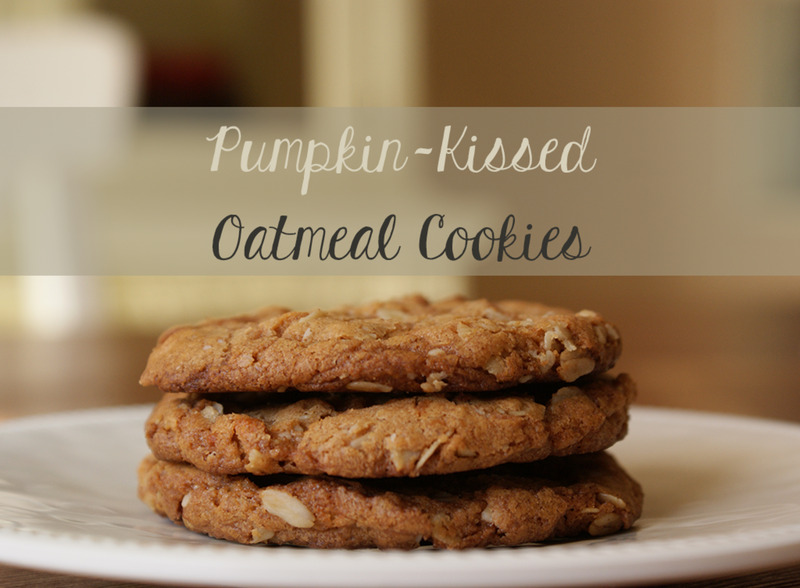 never tried pumpkin with oatmeal before, great idea! 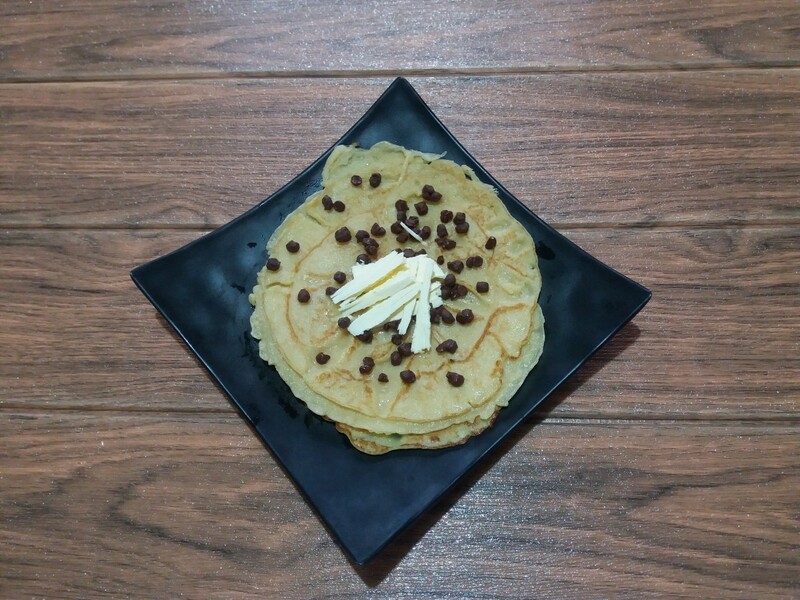 What a fun and yum breakfast. Hope to try it sometime. 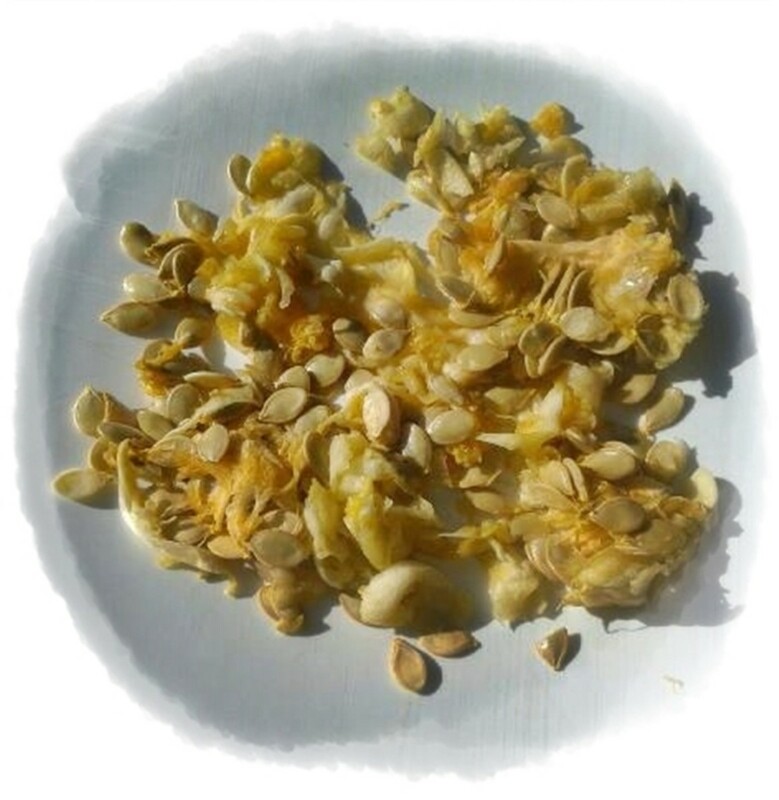 To return the favor of this recipe, here's a tip on pumpkin seeds. Cook them on stovetop or oven in a bit of olive oil and salt with a curry powder. This is our favorite snack!